A song about processing loss. The relationships we have built with people we remember are always with us, and the relationships we build will always be with those who will remember us. Nancy Kopman is a widely respected children's educator and musician whose songs develop early childhood concepts, skills and specific information in early childhood. Her work includes songs about geography, literacy, counting, patterning, learning about colours, shapes and following directions. Her songs also nurture developing skills like deep breathing, self-regulation, building self-esteem and recognizing a wide variety of feelings/facial expressions. 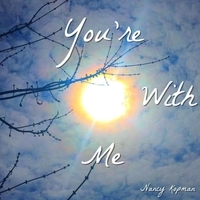 Nancy's single, "You're With Me" is designed to help children who have experienced love and loss cope with the changes they are experiencing. The lyrics in the song serve as an "emotional map", or "inner voice" that helps children focus on how to keep the memory and spirit of their loved one close as they move forward in life. Loss isn't something that just "happens"...it's something you learn to live with. If we can help children learn to live with loss in an emotionally healthy and productive way, we not only preserve the memory of the lost love one, we help children grow and learn while keeping their loved one close to their heart. The lyrics in this song help.